The holiday season is magical: we spend lots of time with friends and family, eat delicious, warm meals, and get to reflect on the past year. But let's be honest: these traditions also come with crowds, travel, and chilly, dry air: the perfect recipe for a seasonal cold. If you're like us and want to a) emerge on the other side of the holiday season without a nose rubbed raw from tissues, and b) do so by making decisions based on science, here's the evidence to get you there. White blood cells (WBCs) are the troops of your immune system: they're the cells that fight against infection and mount your defenses for future attacks. Your WBC levels are therefore a direct reflection of the current state of your immune system and overall health. Cortisol rises due to many different types of physiological stress, be it physical, emotional, or even mental. But this biomarker is especially relevant during the cold, dry winter months: studies show that rising levels can suppress your immune system, leaving you susceptible to all things cold & flu.1 Foods with high levels of omega-3 fatty acids – like nuts, seeds, and fatty fish – can help to bring off-kilter cortisol levels back to normal. If you do get unlucky with your wintertime wellness, you can blame invaders like viruses and bacteria for increased hsCRP levels. Infections can cause full-body inflammation as your immune system tries to fight the good fight, which manifests as heightened levels of indicators like hsCRP. That's why anti-inflammatory foods like avocado, nuts, and soybeans are so popular for maintaining immune function. Proper electrolyte levels (like potassium and sodium) are essential to a full-force immune response. They're what directs water – a key component for countless biological processes – to the cells that need it. Potassium can be much more difficult to get in the diet than sodium, so prioritize eating K-rich foods like fatty fish, squash, and potatoes. Iron is essential for the proper development and maturation of WBCs, and therefore optimal iron levels are critical for a fully-developed immune response.2 But like humans, bacteria need iron for important metabolic functions.3 Therefore, blood iron must be tightly regulated: too little can make the immune system weak, and too much can make invaders strong. A good way to thread this needle is to get your iron from food rather than supplements. Iron-rich foods include red meat (note: not poultry), beans, and shellfish. Magnesium has a role in multiple different layers of your immune system, and therefore even a temporary disturbance or depletion can leave you susceptible to infection.4 But you're in luck: magnesium-rich foods include whole grains, nuts, and seeds. Here are some actionable tips to help keep you from being bed-ridden in the first place. So what's the takeaway? If you feel a tickle in your throat or have been reaching for tissues more often than usual, don't push it in the gym. Get a slight sweat on (sweat is part of the front lines of your immune defense, after all), but save the PRs for another day. 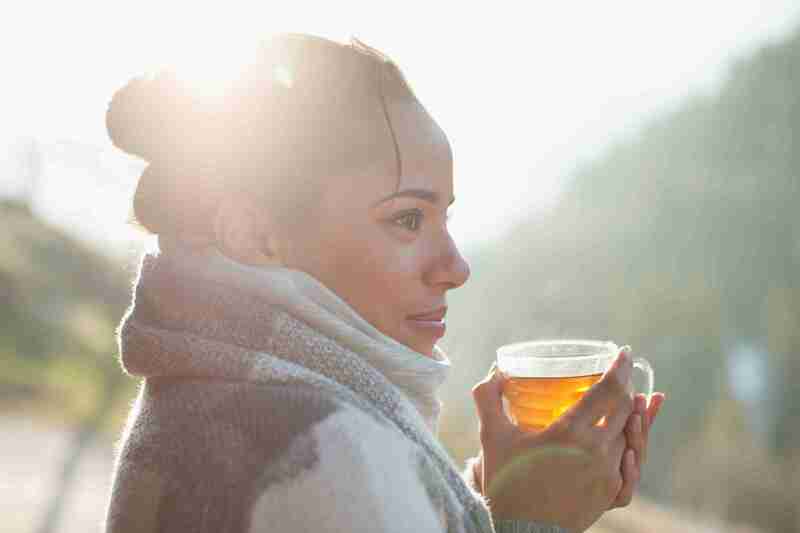 So, while a tall glass of water won't exactly warm your bones on a chilly day, it can help keep the chills at bay. If you find yourself struggling to hit your daily water goals (.5-1 oz per pound of body weight), try things like herbal tea or seltzer water to switch things up. Stay away from juices and other sweetened drinks, though – their high sugar content make them great fuel for unhealthy bacteria in the gut. Unfortunately, many probiotic supplement brands make products that are not effective; you're better off getting these two strains from fermented foods like sauerkraut, kimchi, yogurt, tempeh, and kombucha. So, even if you're someone who "always" gets sick this time of year, there are steps you can take to reverse this trend. And next time you get some suspicious immune-boosting advice, know your good ol' friend Science will always be there for you. Tønnesen E, Christensen NJ, Brinkløv MM. (1987). Natural killer cell activity during cortisol and adrenaline infusion in healthy volunteers. Eur. J. Clin. Invest., 17(6):497–503. Soyano, A., & Gómez, M. (1999). Role of iron in immunity and its relation with infections. Archivos latinoamericanos de nutricion, 49(3 Suppl 2), 40S. Laires, M. J., & Monteiro, C. (2008). Exercise, magnesium and immune function. Magnesium research, 21(2), 92-96. Pedersen, B. K., & Hoffman-Goetz, L. (2000). Exercise and the immune system: regulation, integration, and adaptation. Physiological reviews, 80(3), 1055-1081. Gleeson M, Nieman DC, Pedersen BK. (2004). Exercise, nutrition and immune function. J Sports Sci. 22(1):115–125. 3. Nieman DC. Exercise, infection, and immunity. (1994). Int J Sports Med. 15 Suppl 3:S131–141. Adams, W., & Casa, D. (n.d.). Immune Function: Basic Considerations of Exercise and Hydration. Storrs, CT: Korey Stringer Institute, University of Connecticut. Yan, F., & Polk, D. B. (2011). Probiotics and immune health. Current opinion in gastroenterology, 27(6), 496.